St. Rita, Saint of the Impossible, led a life of many trials. Yet, during that life she also achieved many significant triumphs. She is also known as the 'Peacemaker of Jesus' for her many good deeds. She was the only child born to Antonio and Amata Lotti in a tiny hamlet near Cascia, Italy. St. Rita Miracles began the day she was baptized when bees swarmed around her cradle. They peacefully flew in and out of her mouth and all around her without harming her or anyone in her family. By the age of twelve she wished to enter a convent but her parents felt she would be better protected if she married. They arranged a marriage for her to Paelo Mancini, a town watchman. The marriage was blessed with twin sons. Unfortunately, Paelo was an immoral, quick tempered man and Rita suffered his abuse for eighteen years before he was ambushed and stabbed to death. Their teenage sons wished to seek revenge against their father's death. Through her prayers and interventions her sons did not act upon their revenge. Both sons died of illness within a year. 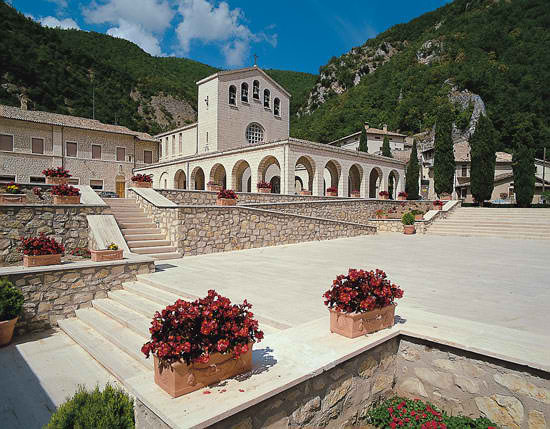 Left alone, St. Rita de Cascia sought the religious life but the Augustinian nuns in the monastery of Saint Mary Magadalen refused to let her enter the convent. Because some of their members belonged to the rival family responsible for Paelo's murder, they feared for the peace of the convent. Most stories of St. Rita agree she was transported to the convent by night through the intervention of her patron saints, St. John the Baptist, St. Augustine of Hippo and St Nicholas of Tolentino. When the nuns found her inside the convent walls the next morning they accepted her. Another story of Saint Rita is that she confronted those responsible for her husband's death and implored them to turn to lives of peace. It is said, in the end, the two rivaling families even signed a document declaring their war against each other was over. Rita of Cascia the widowed mother who suffered great physical abuse at the hands of her husband and mental anguish at the revengeful seekings of her sons, became Sister Rita at the age of thirty-six. St. Rita lived forty years as a practicing nun of poverty and doing works of mercy, charity and peace. When she entered the convent she was given one habit. She wore that habit one habit the remainder of her life and was buried in it. One day, as Saint Rita was kneeling in prayer before a replica of the Crucified Christ. She implored, "Oh my Jesus, let me share in Thy suffering at least by one of Thy thorns." A single thorn from the crown surrounding Jesus' head speared directly into Sister Rita's forehead. This wound bled until the end of her life. The final four years of her life Saint Rita de Cascia was confined to bed as an invalid totally dependant upon the charity of her sisters. She ate little more than the Eucharist and she taught the younger sisters. In her final days, she had one request, that a cousin would bring to her a single rose from her family's estate. It was the middle of January and the cousin thought this to be impossible. But when the cousin went to Rita's former home she found a single rose in blossom on an otherwise bare bush in the family garden. 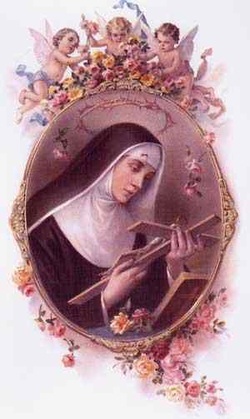 Saint Rita met her Divine Savior on May 22, 1457. She was Beatified by Pope Urban VIII in 1627 and Canonized by Pope Leo IV on May 22, 1900. Because of her many trials and sacrifices throughout her life Rita the Saint is known as Rita Patron Saint of Impossible Causes and desperate situations. She's often entreated by those suffering the afflictions of abuse, sickness, desperate causes, difficult marriages, widows and wounded people, also those suffering from sterility and infertility. There are many stories about her acts of charity and obedience. One Saint Rita Story is that the Convent Mother, wishing to test the obedience of Rita, instructed her to water a dead and withered plant from the convent garden every day for a year. Sister Rita obediently did as she was instructed, every day. At the end of a year, to the great astonishment of her superiors, that dead plant brought forth leaves and flowers and became the most beautiful of all the grape vines in the garden. Today, 500 hundred years later, that same vine remains bountiful and beautiful. Its leaves are dried and powdered and sent all over the world to people who are suffering. Many cures have been reported by the grape leaves. Its fruit is sent to the Pope and to other Dignitaries. The year 1450 was declared a jubilee year by Pope Nicholas V. When St. Rita asked to accompany the other nuns to Rome so she might gain the indulgences of the jubilee, her superiors told her they would permit her to go when the wound on her head healed. It is said, Saint Rita asked Jesus to heal the wound on her head so she might go to Rome with her sisters. God heard her prayer. Her forehead was healed and she was granted permission to accompany her sisters to Rome. When she returned, the moment she set foot in the chapel at Cascia the wound reappeared and remained until her death.